If you're thinking about becoming a truck driver, did you know that you could finish truck driving training in three weeks? 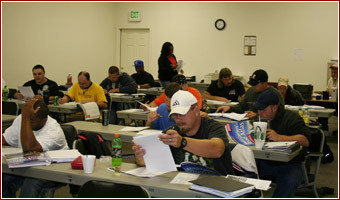 C1 Truck Driver Training has been training new truck drivers for over twenty-five years. In that time, we've refined our approach to truck driving training and created a custom CDL training curriculum to turn you into a safe, professional truck driver. At C1 Ft Wayne, the training begins in the CDL classroom. Through lectures from CDL training instructors, videos, interactive multimedia presentations, and hands-on activities, you'll cover a wide range of truck driving training topics. Our goal is for you to be a safe truck driver, so C1 Ft Wayne makes sure you understand logging procedures, map reading, hazardous materials regulations, accident prevention and mechanical and safety topics. Lectures and activities are led by one of our full-time truck driving training instructors, who has spent numerous years on the road before joining C1 Ft Wayne. The CDL classroom will test your ability to learn and retain the necessary knowledge to become a truck driver. Constant feedback from instructors will help you understand what to study and concentrate. Once you've completed the CDL classroom training, you'll go to our dedicated driving range to get behind the wheel of a well-maintained training truck. This environment provides a safe, supervised area for students to learn and refine hands-on truck driving skills such as shifting, backing, turning, and parking, as well as coupling and uncoupling the trailer. On the driving range, you'll also practice your pre-trip inspection for the CDL skills test. The driving range portion of training is led by veteran truck drivers with multiple years of experience on the road, so you'll get personal stories and advice from people who have been in your shoes. After you've learned the basics of operating a tractor trailer, you'll begin driving on local roads and highways in Ft Wayne. This portion of the truck driving training puts everything you've learned together so you can apply it to real world driving. With your CDL instructor in the passenger seat guiding your way, you'll navigate through roads and practice such things as defensive driving and accident prevention, shifting techniques, left and right turns, and mechanical operation of the vehicle. C1 puts a focus on commentary, so your truck driving training instructor will help guide you as you talk your way through the constant decision-making involved with driving a tractor trailer. Through each stage at our Ft Wayne truck driving training school, you'll have the opportunity to gain the knowledge you need, ask questions, and refine specific skills until you're ready to take the CDL skills test. C1 Ft Wayne's rigorous CDL training process includes a test similar to the CDL skills test, so you'll know when you're ready to take the final test. 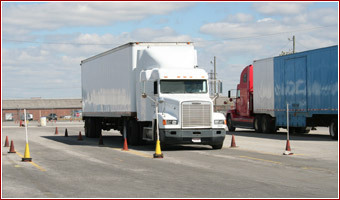 C1 Truck Driver Training in Ft Wayne has crafted a custom and comprehensive truck driving training process. Between our expert staff, CDL training curriculum, and industry standard equipment, you'll leave C1 Ft Wayne with a CDL in hand to join the truck driving industry as a safe, professional truck driver.